Florida Keys: Q&A with Jamie Munoz at Lucy's Key West. 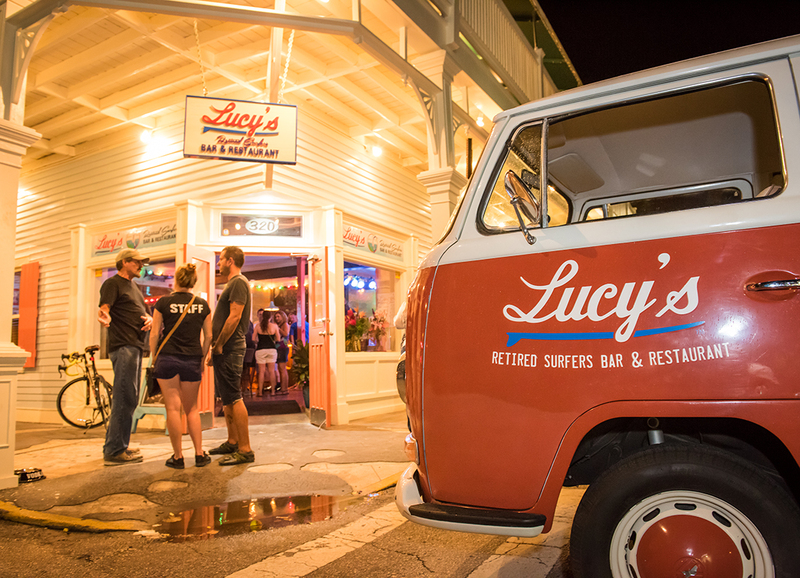 I had the chance to visit Lucy’s Retired Surfers Bar & Restaurant in Key West Florida, and let me tell you, the food is amazing. But it’s not just the food – the drinks are so creative, and the presentation is off the hook! Here is my Q&A with Jamie Munoz, Director of Operations for Lucy’s Retired Surfer’s Bar & Restaurant. Tell me a bit about Lucy’s Retired Surfers Bar & Restaurant Key West? Lucy’s Key West opened on the corner of Grinnell and James Street on September 19, 2016. Offering live music, a spacious bar, tons of special events, and an extensive coastal-inspired menu, Lucy’s aims to offer a place for visitors and locals to hangout. What has been Lucy’s Retired Surfer’s recipe for success? Making tourists feel like locals, and locals feel like family! What are some of the top selling food items on the menu? Our top selling items in Key West are the Avocado Fritas, our Tiki Tacos, the Juicy Lucy, the Catch of the Day, or the Ohana Whole Fish Tacos. What are some of the staff’s favourite Lucy’s drinks? From specialty cocktails to world-famous shots, Lucy’s bar staff always recommends a Shark Attack (vodka, gin, tequila, an 11” shark and the blood of its victims), or an Infamous Scorpion Shot (vodka-soaked scorpion and a gold tequila shot). If you were to recommend one appetizer, one main, and one drink, what would they be? When dining at Lucy’s Key West we recommend starting your night with the Shaka Ceviche, fresh local fish cured in a citrus marinade served with avocado and plantain chips, or the Avocado Fritas, delicious beer battered fried avocados. Key West locals show a preference for the Cabo Shrimp & Grits or Blackened Fish Tacos. For drinks we recommend everyone try Lucy’s famous Scorpion shot (gold tequila with a vodka-soaked scorpion) and receive a complimentary T-shirt. What is one menu item that diners at Lucy’s rave over? Lucy’s diners from all over the world can expect good eats, great drinks, and even better company! As a dog owner, I love that Lucy’s Retired Surfer is pet friendly. What made you allow pets into your restaurants? We originally built Lucy’s as a family friendly restaurant, and what’s more family than bringing your furry pups to dine with you! Hungry pups can choose from our Sur-Fur Doggie Menu including dog-friendly options of puppy hot dogs, popsicles. and Juicy Lucy burgers. With locations in New Orleans, Key West, Costa Rica, and soon Aruba, are there plans for future locations in Southern California, Upper Florida Keys, other Caribbean islands, or Mexico? Lucy’s expansion plans aim to make the concept an internationally-recognized brand and looks to expand into markets where the concepts will resonate with customers. At the moment, our Restaurant Division has opportunities available in other locations but nothing is finalized.